1 1. Define the following types of waterfalls and give one example of each. 2 2. 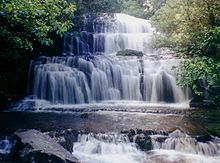 Choose 10 waterfalls, including 2 from near the area or state in which you live, and list the following information about them: Name, Total Height, Waterfall Type, Watercourse, Location. 3 3. Complete two of the following activities. 3.1 a. Visit a waterfall and write a paragraph telling about your experience. 3.2 b. Choose a waterfall (other than ones in #2) of interest to you and record facts and interesting information about the falls that you have selected. 3.3 c. Watch a video about a waterfall. 3.4 d. Make a scrapbook about waterfalls. Include pictures of waterfalls and important information about each one. This may be a group project. 4 4. Water is mentioned in each of the following verses. Describe what is happening in each verse, then tell what the water symbolizes. In looking at waterfalls most often there can be different types represented in various stages of the fall. So you could have a plunge in the first 200m then a section of cascade for 30m vertical but 50m horizontal then a further plunge for 30m. A great example of this is the main waterfall in Yosemite National Park. This at my last look was the worlds 3rd highest. These are the full list of waterfall types with brief descriptions but for the honour you only need to do those asked. •Block: Water descends from a relatively wide stream or river. •Cascade: Water descends a series of rock steps. •Cataract: A large, powerful waterfall. •Fan: Water spreads horizontally as it descends while remaining in contact with bedrock. •Horsetail: Descending water maintains some contact with bedrock. •Plunge: Water descends vertically, losing contact with the bedrock surface. •Punchbowl: Water descends in a constricted form and then spreads out in a wider pool. •Segmented: Distinctly separate flows of water form as it descends. •Tiered: Water drops in a series of distinct steps or falls. •Multi-step: A series of waterfalls one after another of roughly the same size each with its own sunken plunge pool. In a block waterfall, water descends from a relatively wide stream or river. In a cascade waterfall, water descends a series of rock steps. Sutherland Falls is in Fiordland New Zealand. Trampers on the Milford Track usually can walk close to the falls base. NZers use to know this falls as the worlds third tallest falls, but now there is some debate over it. In a horsetail waterfall, descending water maintains some contact with bedrock. In a plunge waterfall, water descends vertically, losing contact with the bedrock surface. Plunge - Havasu Falls near Supai, Arizona. In a segmented waterfall, distinctly separate flows of water form as it descends. In a tiered waterfall, water drops in a series of distinct steps or falls. Purakanui falls. Catlins Southland New Zealand. This is a world famous falls visited by tourists from all over the world. http://gowaterfalling.com/ - Mostly covers the Great Lakes region, but covers other areas as well. http://www.goby.com - You will have to enter some search terms to get data from this site. Try "waterfalls" for "What would you like to do" and then the name of your state or locality for "Where." http://www.newenglandwaterfalls.com/ - Covers New England. If you know of more resources, please add them!